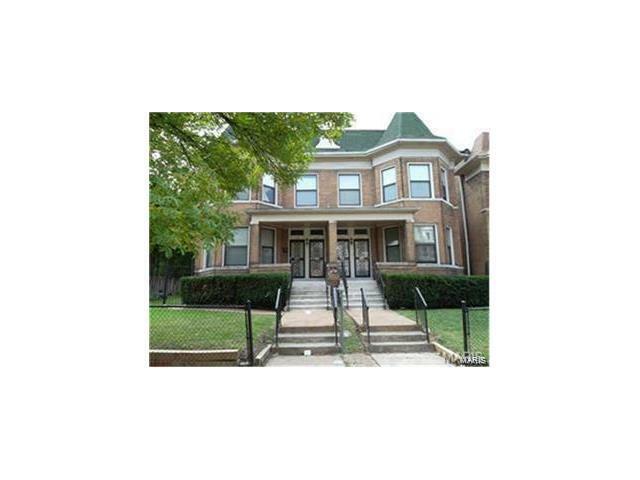 WONDERFUL 4-unit 6220 sf HISTORIC ALL-BRICK GEM just a block from Delmar, near Wash U, SLU, Rankin, Barnes & Harris-Stowe. INCOME PRODUCING PROPERTY near FOREST PARK! $17,100+ NET INCOME with potential for $25,600+ when fully leased. Easy-to-rent LARGE units feature 9' CEILINGS, 1555 sf, 3 beds/1 bath each. Seller INCLUDING ADJACENT LOT for total of .30 ACRE, fenced back & side yards for outdoor play & recreation. AMAZING 1898 architecture + modern upgrades, COMPLETE 1990 RENOVATION + recent electric, plumbing, sewer from garage to alley, FENCED YARD, 2-CAR OVERSIZE GARAGE, big deck, newer a/c in '08-12, new furnaces '10-12. Nicely maintained Parking pad by garage fits 4+ cars. Private lower level laundry hookups for each unit. FANTASTIC MAGNET SCHOOLS nearby. Many transportation options with METRO LINK, Trolley Project, Page Ave, Highways 64, 44 & 70. Redevelopment area with several neighboring homes recently rehabbed & more underway.